Program launches a series of holiday activities designed to give back. The volunteers from Narconon Redwood Cliffs were warmly welcomed, and their work in helping to prepare and serve Thanksgiving dinners to the homeless in Santa Cruz were appreciated both by their fellow volunteers and by the guests. From their location in Watsonville, California, the staff of Narconon Redwood Cliffs frequently engage in community outreach and volunteering activities to help people in the surrounding areas. Most recently, on Thanksgiving day, a team from Redwood Cliffs traveled up the coast from Watsonville to nearby Santa Cruz, where they joined many other volunteers at a charity feast provided by the Acts of Love Foundation. The event was a major success and made it possible for a large number of people to enjoy a fresh and warm meal on Thanksgiving when they otherwise might have been left hungry. A long line formed outside the Santa Cruz Civic Center, as more than 1,000 people showed up to receive the kind charity of the Acts of Love Foundation volunteers. It was a festive event, with local bands and solo musicians taking the stage to perform and add cheer to the auditorium where the Thanksgiving dinner was held. There was a major volunteer turnout with more than 100 men and women sharing in the holiday spirit on Thanksgiving day. While others were watching football on television or lining up outside department stores to take advantage of early Black Friday sales, the volunteers from Narconon Redwood Cliffs and others were working to ensure that homeless and disadvantaged people in Santa Cruz had something to be thankful for. The partnership between Narconon Redwood Cliffs and the Acts of Love Foundation is a natural fit. 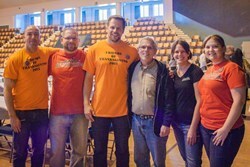 Established in 2001 by Pastor Dennis Adams, Acts of Love has a purpose that is closely aligned with that of Narconon -- “to help people who are in need to reestablish themselves in their local communities across America.” This purpose echoes Narconon's intention to help people make a stable recovery from drug and alcohol addiction so that they can reintegrate with society and lead productive, happy lives. Acts of Love focuses on helping veterans, widows, unwed mothers, runaway teens, foster children, seniors, and mentally challenged individuals. They have served more than 307,000 meals since October 2001. In doing so, they frequently team up with like-minded individuals and groups, as demonstrated by their stated purpose “to engage in all networking and benevolent activities that will further the serving of the impoverished and disenfranchised persons for the benefit of establishing health, both mental and physical, and re-entering into society to be productive members of the community.” The volunteers from Narconon Redwood Cliffs were warmly welcomed, and their work in helping to prepare and serve Thanksgiving dinners to the homeless in Santa Cruz were appreciated both by their fellow volunteers and by the guests. Thanksgiving comes only once a year, but the staff of Narconon Redwood Cliffs take the opportunity to volunteer and help others year round. For example, they were recently found at the Laguna Seca raceway near Monterey during a major international motorcycle race, handing out anti-drug literature and other items to help people understand the dangers of drug use. Earlier this year, they participated in an annual Strawberry Festival in Watsonville, as well as joining with local law enforcement to help host the National Night Out community event. They also regularly send out representatives to deliver drug education lectures at high schools around Monterey Bay and throughout the surrounding area of Northern California. The goal of Narconon extends beyond rehabilitating drug and alcohol addicts to encompass working in the community to make it a safer, cleaner and happier place for everyone to live. For more information, call 888-284-4495.